The holidays are quickly approaching. Is your brand ready for the upcoming surge in online traffic and in-store visits? Here are 10 local marketing tips designed to help your brand capture more business this holiday season. This holiday season, ease the path to purchase by incorporating third party apps that help to turn local page visitors into customers. If you have a well-optimized local page, you’re already capturing just the kind of local traffic you want: customers who need the products or services you can provide. But local pages aren’t just about information. Think of the local page as a digital storefront that invites the customer to do business with you. 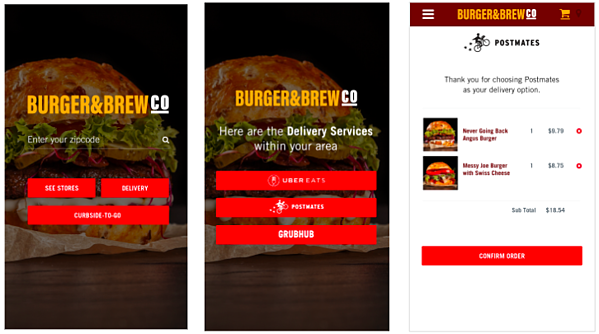 Let your site visitors order delivery with Postmates or DoorDash, check wait times with DineTime, browse products on your Instagram feed, or get a ride to your store with Uber. Our local pages can be optimized with all these features and more! Many stores have extended hours for the holidays, but those extra hours won’t do you much good if they aren’t well advertised online, where 87% of today’s shoppers begin their purchase journey according to a 2018 Salesforce study. Luckily, Google and Yelp have excellent support for entering special holiday hours in advance and displaying them prominently in online profiles. Other sites may not be quite as smooth in their approach to special hours, but we can still help you coordinate updates so that hours are properly synchronized across all of your owned and managed properties. For a short, intense period of time, the holidays are the only thing that matters in local commerce. 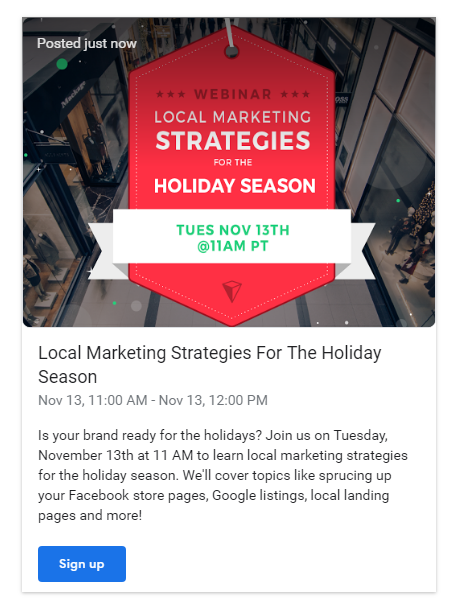 Because most of the content in your Google listing is longer-lasting, it has been difficult in the past to use Google My Business to capitalize on the holiday opportunity, but Google Posts really changes all that. Posts are a great way to showcase holiday-oriented special offers, events, and promotions, with timely, prominent content and clear calls to action. For extra appeal, create a video to use in place of a static image. For many of us, the holiday mood starts when we see decorations go up in local stores. Your Facebook store pages can offer the same holiday feeling to shoppers who see you in their feed. In addition to a well-crafted campaign of social posts for the season, be sure to add holiday-themed profile and cover images to your Facebook pages, and while you’re at it, be sure each page has a CTA button that encourages visitors to take the next step and start shopping. The holidays are a time of good cheer, but they can undoubtedly be stressful too, for consumers and store managers alike. Consumers may be more likely at this time of year to turn to online reviews to vent about less-than-perfect in-store experiences. If that happens, it’s more important than ever to keep your cool and remain professional. Remember, when you respond to a review, you’re not just responding to one customer. You’re responding in public to all the other customers and potential customers who may visit your online profiles. Make a point of engaging with consumers in a positive way throughout the holidays. 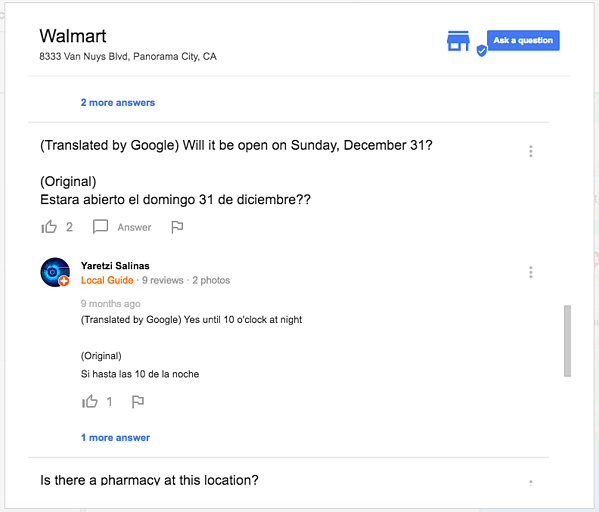 For those not familiar, Google has a fairly new feature called Questions & Answers that lets any user ask -- and answer -- questions about a local business from Maps or the Knowledge Panel. For some verticals, especially those in the retail sector, Questions & Answers has really taken off in the last several months, but businesses may not be paying close enough attention to the questions consumers are asking. You can answer questions yourself through the GMB dashboard, or use Brandify’s solution. Either way, be sure to make use of this new channel for engagement. These days, there are many critical places where your local content can appear to consumers: on your website, in organic search results, in local listings, on mobile apps, and now on voice assistants like Alexa and Google Assistant. Pay close attention to any potential trouble areas with store information like name, address, and phone number, in particular if any of your locations has recently moved or if you’ve opened new locations this year. Brandify can help to ensure that your location data displays perfectly to every consumer across every interface, so you don’t lose a single opportunity to capture holiday shopping traffic. Learn how to optimize your business for the voice search era by reading our 7 step guide. You’ve spruced up your stores for the holidays, but do you know which improvements or new offerings will matter the most to your customer base? Luckily, much of the evidence you need in order to analyze consumer sentiment can be found in your online reviews, but it can be a real challenge to uncover the most important insights from thousands of reviews across multiple sites and store locations. Tools like Brandify’s Social Monitor can identify trending topics so you can fix what customers don’t like and do more of what they love. Consumers looking for items on a holiday shopping list are more likely to search locally for specific products and brands, rather than by business categories like “clothing store” or “jeweler.” You may be doing well in a category-based keyword search, but how can you capture product and brand traffic? 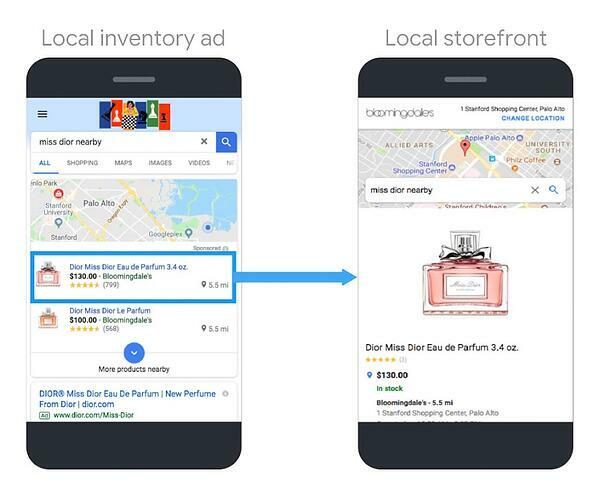 Consider Google Local Inventory Ads, a product that helps businesses link local listings to store inventory through the “See What’s in Store” tab. Local Inventory Ads also surface sponsored listings for specific products, so you can appear at the top of searches for the latest holiday trends. A robust paid search strategy is the single most effective way to augment your organic traffic, a fact that grows increasingly important when you’re competing fiercely for the attention of holiday shoppers. From Black Friday through to Christmas Day, advertisers generally see a spike in consumers who click through Google Ads for location details. This makes sense considering that the holidays are the time when the intent to purchase immediately and locally reaches its yearly peak. Make sure your ad campaigns include location extensions so that consumers can get from an ad to a local store quickly and easily. 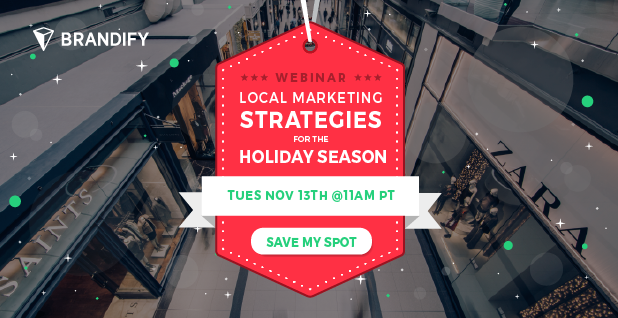 You'll walk away with the knowledge to create an effective local marketing strategy for the holidays and a carefully crafted checklist to keep you on track (exclusive to webinar registrants only).